The political victimization of Steven Salaita, whose appointment as a tenured professor at the University of Illinois Urbana-Champaign (UIUC) was revoked because he tweeted outraged protests against the slaughter of Palestinian civilians in Gaza, is a chilling attack on core democratic rights, including freedom of speech and academic freedom. 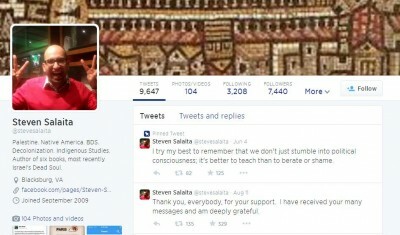 The university administration and the University of Illinois Board of Trustees have justified the witch-hunt against Salaita in the name of “democracy,” “civility” and “pluralism.” This not only expresses the hypocrisy that pervades these institutions, it reflects the evisceration of all democratic principles and mechanisms within American capitalist society as a whole. The termination of Salaita’s appointment as a tenured professor of American Indian Studies at UIUC came after he had given up his position at Virginia Tech and moved with his wife, who also left her job, and young child to Illinois. The pretext for his removal was a series of tweets he had sent in the midst of the one-sided Israeli war on the Palestinian population of Gaza. Only a grotesque and willful distortion could attribute to Salaita support for anti-Semitism based on these messages. This, of course, is precisely the specialty of the American right and the Zionist lobby, which proceeded to do just that. That this noxious political alliance of right-wing ideologues and rabid Zionist anti-Palestinians found powerful backing has been established with the exposure of emails from prominent wealthy donors to the university threatening to withhold funding if the administration failed to carry through the politically motivated victimization of Salaita. Kennedy, the son of the assassinated senator and Democratic presidential candidate Robert Kennedy, is a political appointee of Illinois’ Democratic Governor Pat Quinn. He has acted as a fundraiser for Barack Obama and other Democratic candidates. If constitutionally protected speech criticizing the policies and actions of Washington’s key Middle East ally, Israel, can have no place “in our democracy” or “in our university,” what other views can be outlawed and suppressed? Why not opposition to imperialist war, or criticism and questioning of the “war on terrorism” pretexts being used to drag the American people into another predatory military intervention in the Middle East based on lies? The proscription of views as having no place “in our democracy” has a long and ignoble history in the United States, reaching its apogee during the McCarthyite anti-communist witch hunts of the 1950s, which half a century later still cast a dark shadow over American political and intellectual life. The revival of these anti-democratic methods today in cases like that of Steven Salaita is deeply rooted in the degeneration of American capitalism, expressed most sharply in the poisonous combination of unrestrained militarist violence abroad and unprecedented social inequality and monopolization of wealth at home. This is why the new McCarthyism enjoys the support not only of the political right and Zionism, but also ostensibly liberal Democrats like Kennedy and other supporters of a president who has arrogated himself to the “right” to order the assassination of US citizens, while overseeing a massive illegal spying operation that sweeps up virtually all electronic communications of citizens of the US and countries all over the world. The defense of fundamental democratic rights today is inseparable from the development of a struggle against war and the independent mobilization of the working class in defense of its social and political rights. As part of this struggle, the demand must be raised for an end to the victimization of Steven Salaita and a halt to all attacks on academic and intellectual freedom, which are bound up with the preparations for police state rule.